For lunch, I was scheduled to have a “California Inspired” Wrap kit. It came with an artichoke side salad. 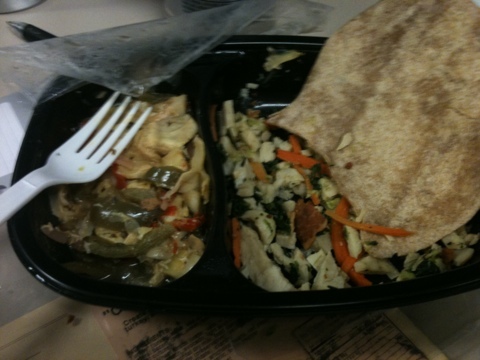 Out of all the meals sent this week, I was least enthusiastic about it. After trying it, I was very pleased and wouldn’t mind having it sent my way again. 400 calories, very flavorful. Although, the wrap itself had holes in it from being folded, so creating a wrap from the contents was just not reasonable. California Inspired “Wrap” kit might have been a better name for it.